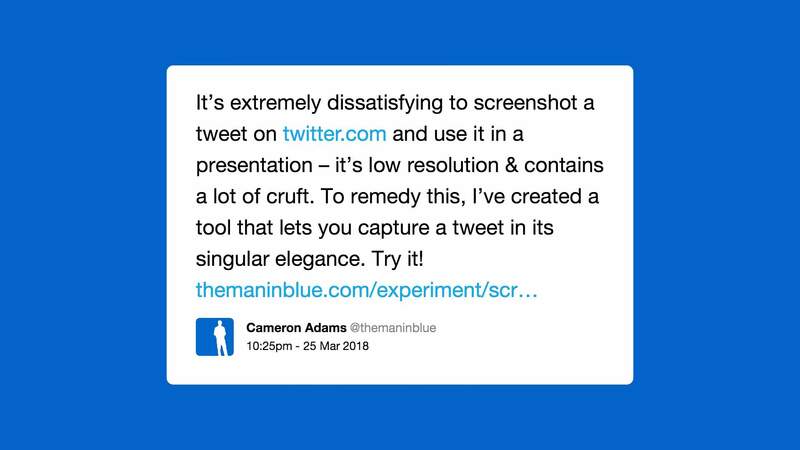 Nice new tool by Cameron Adams (The Man in Blue): just enter the URL of a tweet, et voila: you get a screenshot – without any cruft and in a decent resolution – in return. To do this on the technical side, I fetch the tweet text using Twitter’s API and then analyse the author’s profile picture using Color Thief; this gives me a nice background colour that matches their profile picture, which I then layer with a lightly transparent copy of their Twitter header to produce a good-looking backdrop to their tweet. To capture the final image, I use the excellent html2canvas to render all the HTML to a canvas element and then save out the pixel data. Bingo! You get an image of your tweet. Supports link and hashtagh highlighting, but would also love to see image support. That’d really complete it.